Straw bale walls in the master bath are hidden behind a gray decorative concrete wall overlay sealed with a waterproof acrylic. 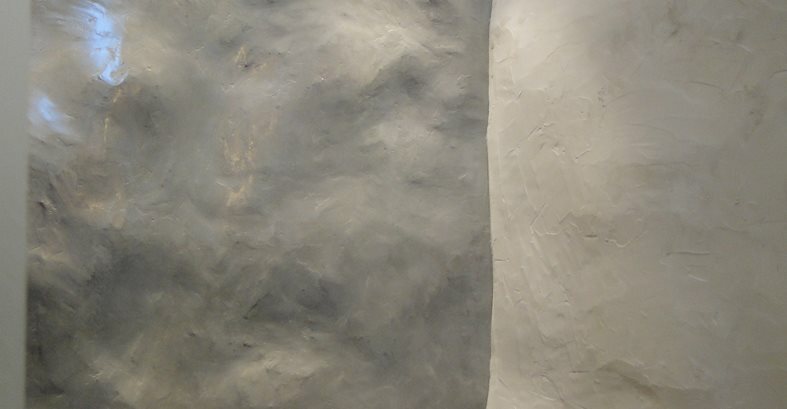 The decorative concrete overlay (left) was given a textured finish to match the adjacent plaster-covered walls in the master bath. The kitchen island, countertops, window sills and backsplash are all cast-in-place concrete, integrally colored a smoky gray. The 8-foot-long backsplash and window sill in the kitchen were cast in one piece. The same overlay system was used on shower walls in the second-floor bathroom. The window sill is also concrete. You would never know by looking at the modern interior of this unique eco-friendly home located in Lancaster, Pa., that the walls are actually made of straw bales, an age-old construction material enjoying resurgence in the green building community. 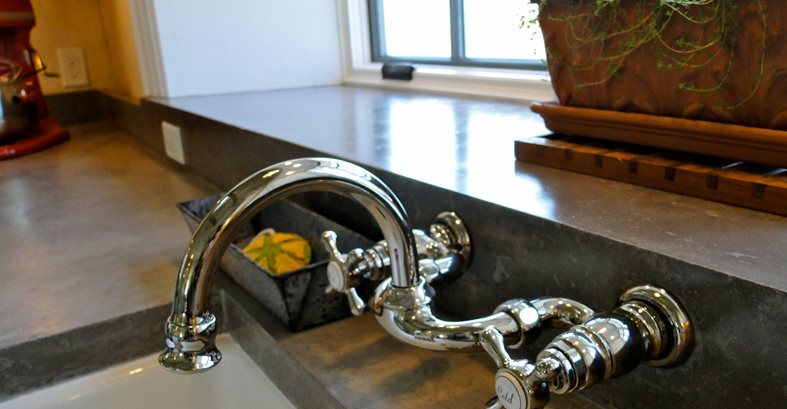 The marriage of old-world techniques and modern approaches is a theme carried throughout this home, which is built of locally salvaged materials combined with newer sustainable alternatives, including concrete shower wall overlays and countertops. Occupying a small and often-forgotten segment of historical home building, straw bale structures provide for ultra-efficient spaces with an all-natural approach, according to homebuilder and owner Jesse Pellman of Longview Structures, Manheim, Pa. “Clean, holistic, quiet, and with a uniquely approachable aesthetic, bale homes possess character that’s hard to come by with most new construction methodology,” he says. 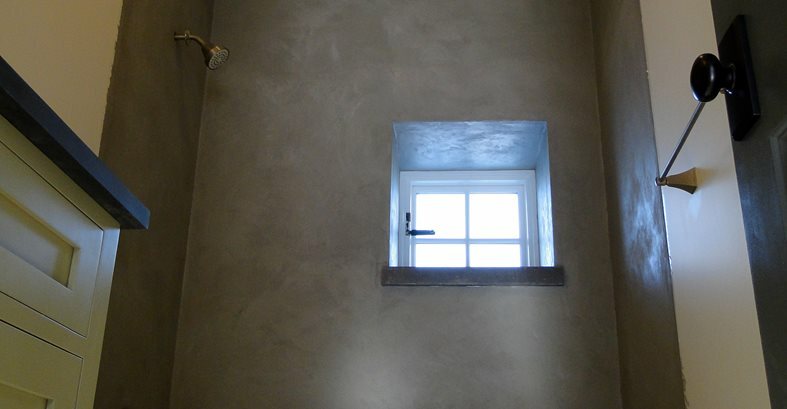 Because the plaster-covered straw bale walls weren’t perfectly flat and needed to be waterproofed, Cluley covered the shower walls with an eco-friendly cementitious resurfacing material called Deco-Poz. “I used this overlay because even at a 1/8-inch thickness I can create a watertight surface, which is essential in a shower,” he says. The system contains recycled pozzolan additives that reduce the portland cement content up to 25% while increasing compressive strength and durability. 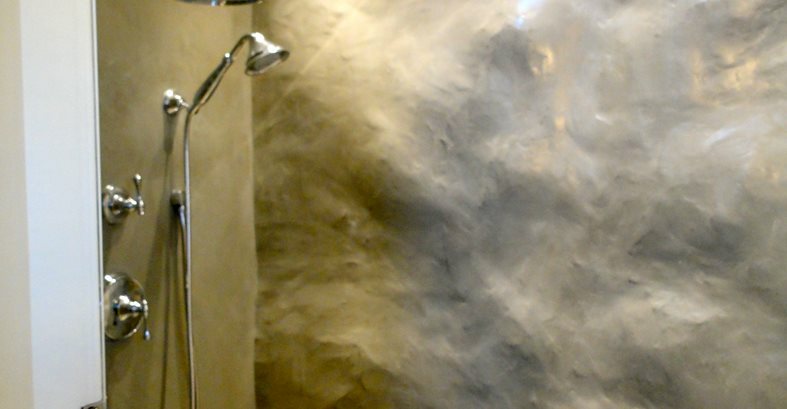 Cluley primed the shower walls with a nontoxic water-based epoxy and then applied the wall overlay using Japanese plaster trowels and concrete pool trowels to give it a rustic texture that matched the bathroom’s plaster walls. Finally, he sealed the shower surround with a marine-grade acrylic urethane designed for submersible applications. The same resurfacing system was also used on the walls in the home’s second-floor shower. 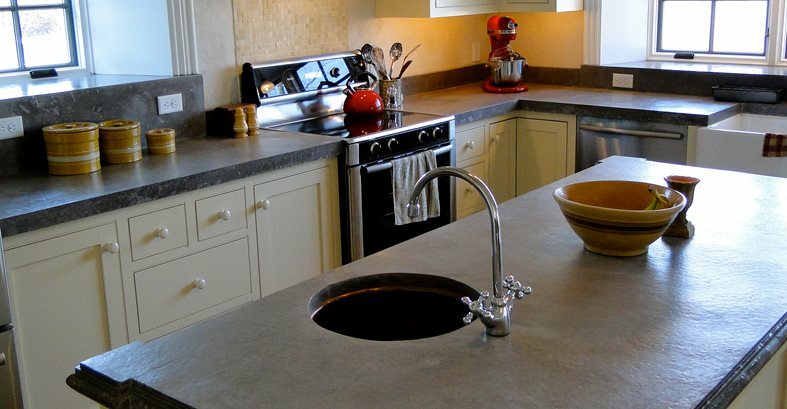 In the kitchen, concrete was also the best solution for the countertops, island, window sills and backsplash. Because of the irregularities in the walls, template molds were used to make the concrete window sills. Cluley cast the kitchen island and countertops using Buddy Rhodes bag mix in a smoky gray tone, giving the island a decorative double-radius edge. To see more photos of the straw bale house, visit www.longviewstructures.com/projects/. Tellus 360 Design & Build, Lancaster, Pa.
Ideas and deals each week!